Station 17 is a music band from Hamburg. 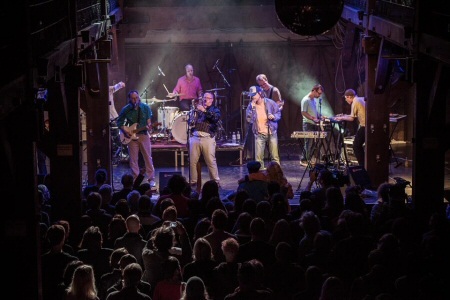 It consists of disabled and non-disabled musicians and was founded in 1988 by residents of the group home 17 of the Evangelical Foundation Alsterdorf, professional musicians and Kai Boysen to record only one album in the framework of a project. 1989 supported the Phonogram the band. As a result, it came to working with various producers such as Holger Czukay , FM unit , Thomas Fehlmann , DJ Koze and Cosmic DJ . An integral part of station 17 is the change and development of the human structure. Accordingly, "this whole musical change also associated with a new environment that scored in the three years since 'fever' this band" goes, says producer Tsitsigias. "This has changed the musical work has totally changed. There were singers to as Masoumi, Gharibi or Schnathorst. Through their involvement, the possibility has arisen to integrate properly formulated texts in the music and implement clearly defined Song procedures for the band." And yet, the step from "Fever" album to the current pop gem "Everything for everyone" is likely to be one of the greatest that ever a German band has taken from one album to the next. "Certainly there was now also a certain lassitude in terms of instrumental music and experimental music elongated" explains Tsitsigias. "Live we will do that still, but for the new album, we were keen to have a whole new concept:.. Classic songs point." One and a half years the band has worked in changing work units in bringing this new level of songwriting with the previous attitude of the completely free music making consistent and redesign . 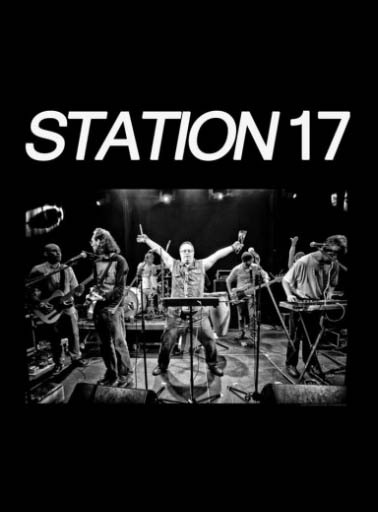 "Station 17 was always an experimental band - I think the only reason we exist even after 25 years still - and now is just pure pop for the present experimental design." explains spot, next to Tsitsigias the second producer of the album. New are , of course, the role and function of the texts in this form . " In some texts , such as ' Everything for everyone ' , lies a clear message , based on a program ," says newcomer Röh (formerly Thunder and woman ) . " We have nothing against adequate social criticism, even in their own right . We are negotiating is the discrepancy in workshops for disabled people between the supervisors and assisted , which is particularly noticeable in terms of pay . The view that a person with a disability have not claims as their own basic security is not right Cause we make daily experience . . . It is not enough these people want to participate in society , and that just costs money "
How station have 17 newly established for this album in their enclave, a private studio in Hamburg Stellingen with the pretty name "Stel Air", found in the collective participatory process, a new level of creative interaction which is expected to provide widely conversation without question. Of course, one danger is aware scaring with such a radical step some of the veteran fans, but an artist must take this into account? In contrast, now there is a new possible level: the width of the commercial acceptance. Desirable? "Yes, why not? ", Asks Tsitsigias back. "I'm glad we have produced this album with songs that, at least theoretically have great potential radio. And so we should actually end up in the charts, it can be the whole thing yet do nothing but good." Because so much remains ultimately hold: A band with such a meaningful social, creative and inclusive superstructure looking in vain for a second time - and not just in Germany. And with so concise music you can wish them every success only. Station 17 feat. Streuner (Frittenbude) "Alles für Alle"
Can-Do Musos want to provide guidance and hope to all musicians with challenges. Music is empowering and has no limitations and everyone should have a chance at their dreams. To contact the Can-Do Musos team, please email us or use the Online form below.